What are the Disney Slang Word Meanings? 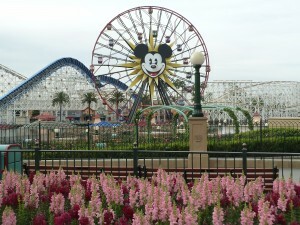 This means that you can visit Disneyland and California Adventure each day of your visit as many times as you want. The 3 days doesn’t have to be consecutive. If you want to take a break and go to the beach one day you can. You get to enter 1 hr before Disneyland to the area’s that allow it, and 1 hr before California Adventure. California Adventure is across the road from Disneyland so it is easy to get back and forth. California Adventure opens 1 hr after Disneyland. It is a great way to get Fast Passes for rides that are really long. It is also a good way to get in line to meet the Princesses. You can get a lot done with the Magic Morning. They only allow it certain days of the week, so make sure you check with them and plan accordingly. You also can only use Magic Morning once for those three days. If you stay in a Disneyland Resort then you get in early every day of your visit. Baby Switch Pass or Stroller Pass- The procedure for using the pass can vary from attraction to attraction. In general: It allows you and your family to wait in line together (typically only to a certain point). One adult then waits by the exit of the attraction with the child or children who won’t be riding while the other adult waits in line with any remaining guests in the party and rides the attraction. Then, after they’ve rode the attraction, the other adult who had been waiting will get to ride. They will get to go with one of the children or an adult who already went so they don’t have to ride it alone. I have also used it by asking the cast attendant at the beginning of the ride for a stroller pass, and they will give me a fast pass. Then one adult goes in with the child who can ride (or they can go alone) while the other waits outside of the line with the child who isn’t able to go. Then when they are done riding the adult who waited takes the child who just went, so they aren’t alone and they go in the fast pass lane. I have saved the fast pass and have come back after we rode other rides because sometimes the child who didn’t ride doesn’t want to sit in one spot to wait for too long. Professional photographers are everywhere in the park and will take pictures of your entire party for free. They will even take a picture of your family with your own camera if you ask. They will then hand you a PhotoPass, which you can then give to the next photographer to have all your photos linked together digitally. At the end of your trip, go online to view and purchase a CD of your photos or download them directly. We always will have them take a picture on their camera, but we take a lot of pictures on our own camera as well. Their photos are a little pricey to buy and we never really like the photos they took. We always liked our own, so we have never actually bought their photos, but if they take the photos then at least you have the choice. Thanks for visiting Disney Slang Word Meanings. Please comment if you know of any others!